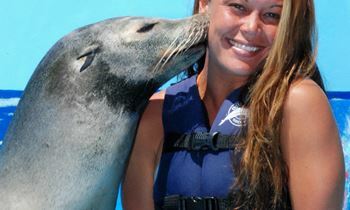 Several shows w/ dolphins, sea lions, & more! There are 3 different options to swim with dolphins. 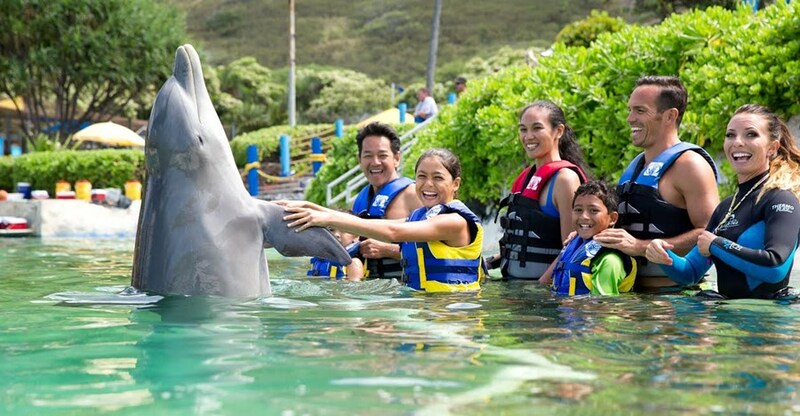 We recommend you go for The Dolphin Royal Swim. Why? 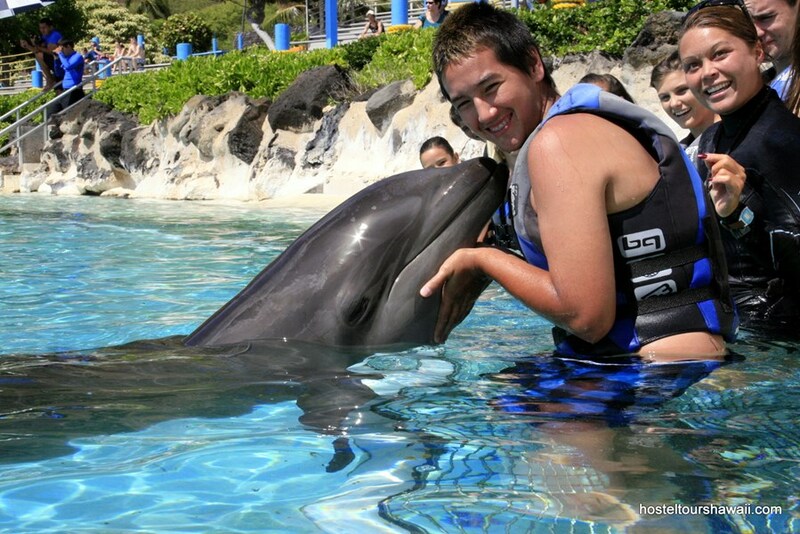 Because this is one of those things you will probably never have a chance to do again, so you might as well have the maximum interaction with these amazing creatures in Hawai‘i! Reserve in advance, space is limited! begins with an affectionate dolphin handshake and kiss on the cheek. Next, you’ll go for a fun dorsal fin ride. The most breathtaking moment comes during the foot push, when you feel all the strength and energy of these wonderful marine mammals as they jet you across the water from the bottom of your feet. 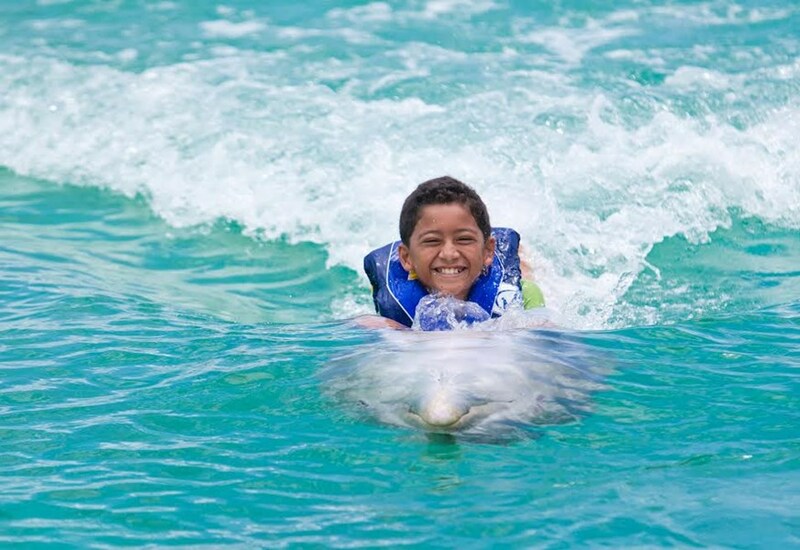 includes a fun belly–ride, handshake, & an unforgettable dolphin kiss! 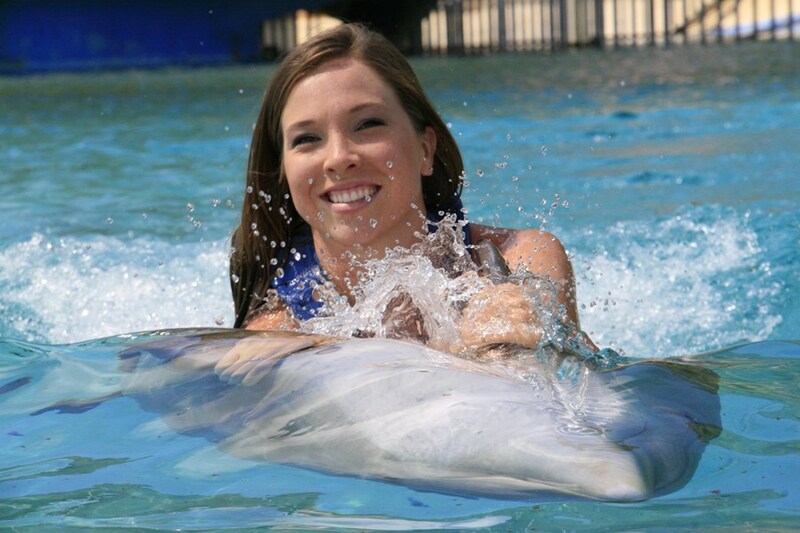 You can pet the dolphin, pose for a big dolphin kiss, perform various close contact interactions, & view a dolphin underwater – all while a trainer educates you about these amazing animals. 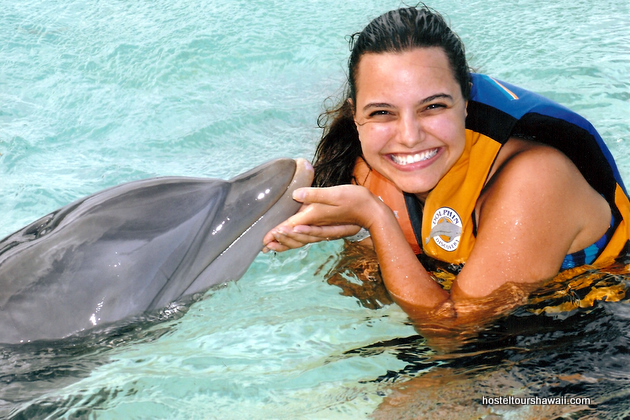 is the most basic option: you will play, kiss & dance with the dolphins all while learning about their intelligence & friendliness! All these options include FREE round trip transport to the park & admission to see several other shows! Water time with the dolphins is 30 minutes. Remember to take a swimsuit & towel. Pick ups are early morning between 7:30am- 11am at Waikiki. This is one of those "once in a lifetime" activties, that is only done in several places in the world. 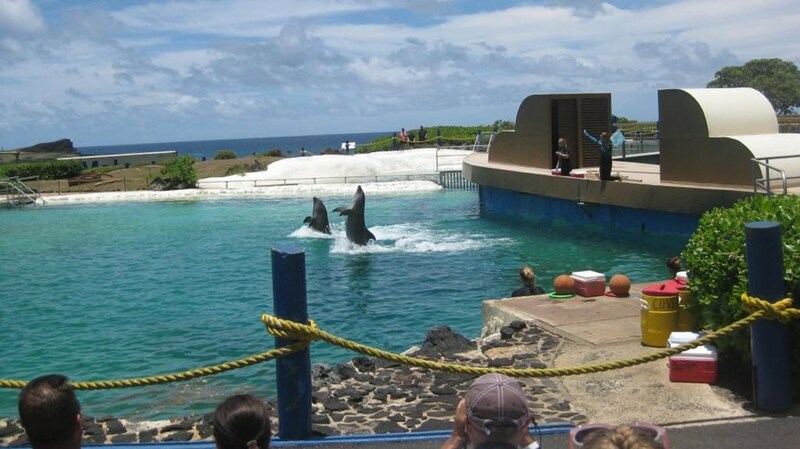 It's such a popular activity, that when President Obama came to Hawaii he rented out the entire Sea Life Park! 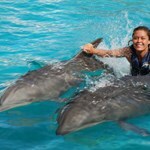 Each activity includes background knowledge on these amazing creatures & plenty of water time to interact with the dolphins. 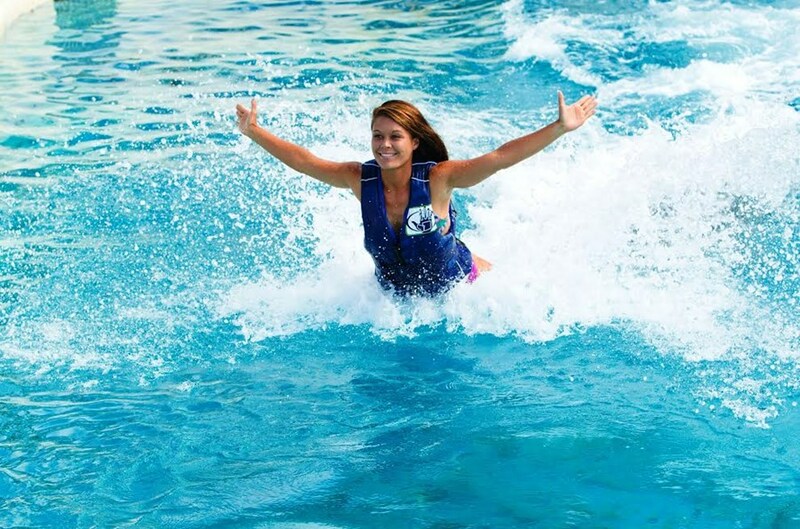 The Dolphin Royal Swim includes the dolphins pushing you down the water, for an amazing thrill! The main complaint is that some people do not like this tour because it is "touristy." 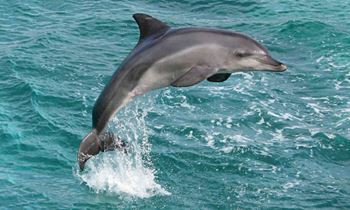 Again, with any kind of interaction with animals, you can do one of two things, go in this controlled environment & get guaranteed interaction with dolphins, or take a Dolphin Sail & snorkel, where the boat drives around chasing dolphins to hope they will be there in time when you go and snorkel. Obviously the dolphins in the wild will not interact with you and you cannot touch them. It is your choice, but both are around the same price and have trade-offs. You must be able to swim to do this option. For those who cannot swim, this is the only option possible. 20-minutes interaction with dolphin without getting in the water, minimum age 1 yr. old. 1-2 yrs. old FREE 1 yr. and over. A maximum of four children ages 12 yrs. and under must be accompanied by a adult over 18yrs. Pregnant women may participate. 0 FREE with paying adult. 8-12 years with a paying adult 18 yrs+in the water Must be booked with at least one other interactive programs at retail rate. 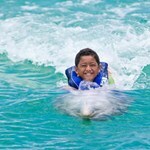 4-7 years with a paying 13 yrs+in the water Must be booked with at least one other interactive programs at retail rate. Daily 8:00 AM - 8:50 AM 2:30 PM - 3:30 PM Waikiki & Kahala Area Hotels. Exact pickup times & location will be included in your confirmation email. After a quick life vest fitting and instructions we were taken to the tank and in the water. Both of us has heaps of fun! We got to play with both whalphins and another dolphin. Photos and video were a bit pricey but that is expected. Quick tip: if you do the dolphin foot push please make sure your bottoms are on securely, wardrobe malfunctions are not pleasant! Overall the encounter was quite enjoyable. If you were visiting the park without having an encounter I would probably avoid it as it is quite small. 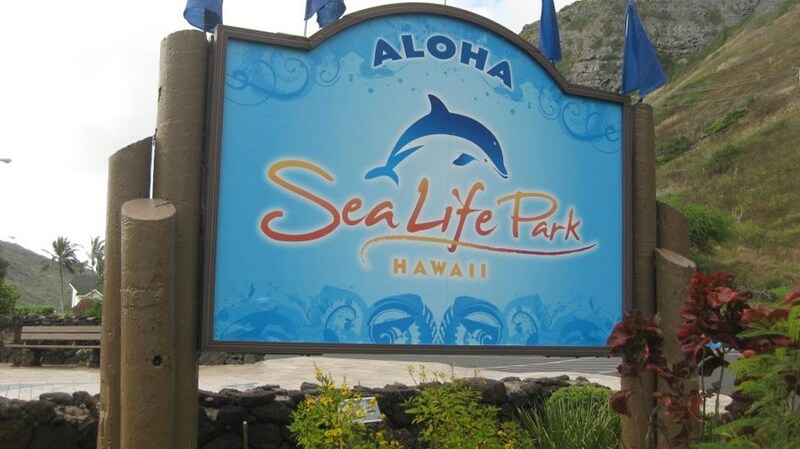 My wife and I visited Sea Life Park on Oahu, on August 20, 2014. We paid for the swim with dolphins experience. 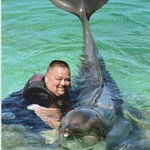 We were treated to a memorable experience with the world's only "wolphin" ... a whale/dolphin cross breed! 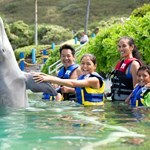 Riding the wolphin was the highlight of my wife's week in Oahu! 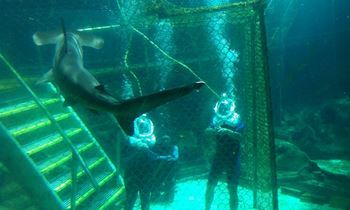 The trainers were patient and warm, answering questions I posed, and insured that we had a warm greeting, respectful ... moreswim time with the others in our group, and they clearly cared about the animals under their care. The park is smallish and somewhat older looking, but quaint and clean. 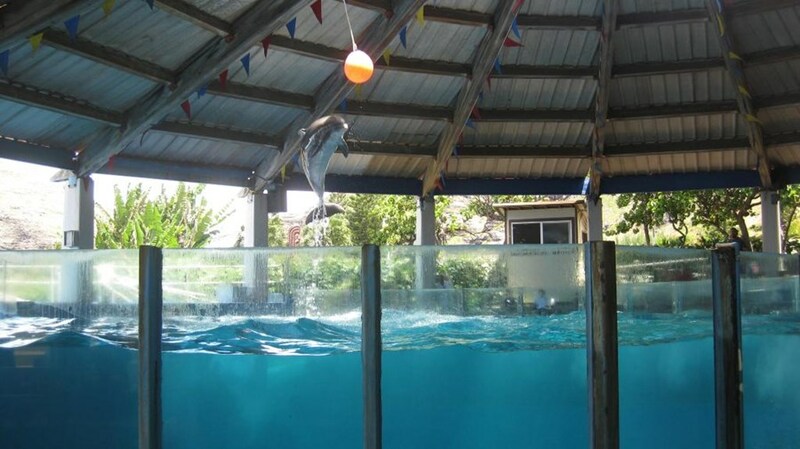 Having pre-paid for the dolphin experience, we arrived at the park 15-30 minutes before the opening time for the general public. 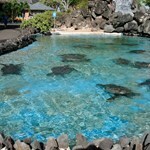 Which gave us ample time to see the shark tank and also the sea turtles. Another of my wife's favorite sea creatures! And the view from the park of the nearby islands (Rabbit Island, and the other, forgot it's name now), is just awesome! 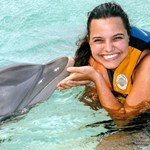 Even if you don't do the dolphin experience, it's worth the trip getting there just to see the coastline and the view. 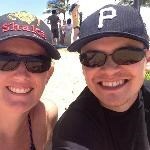 We stayed at Waikiki, Outrigger on the Beach. 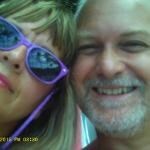 My wife and I attended Sea Life Park, and were able to view several attractions after our time in the Dolphin Swim Experience. 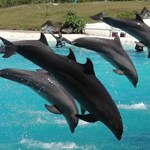 The Dolphin Swim at Sea Life park was very well-done, with knowledgeable trainers and small, intimate group sizes. For any Japanese park guests, the trainers were fluent in both English and Japanese, which helped in moving along the experience seamlessly. During the experience, ... morephotographers and videographers were great at snapping photos, although you are welcome to have an out-of-water guest snap them for you. Any pictures/videos from the park do cost money, and can be pricey for multiple shots. For any of the experiences, make sure you leave all of your jewelry, hair pins, sunglasses and loose articles behind. You can buy a locker for these for a one-time use fee of $3. Other than that, the park seemed a bit dated, but has a beautiful view of the water and very passionate trainers. The sea lion show was hilarious for all ages, and the trainers seemed very interested in answering questions about the animals. 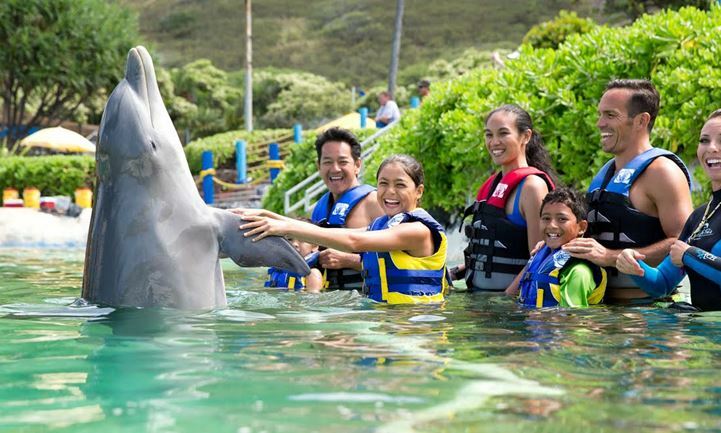 Overall, a great way to pass a day with children, and an excellent way to have a once-in-a-lifetime experience swimming with dolphins or sharks. 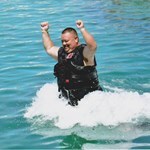 The manta ray swim was the highlight. The two instructors provided huge hands on for the boys (ages 11 and 8) and they got to snorkel and feed lots of fish too. definitely the memorable part of the day for them. Our day was saved by the gal at check in -out hotel tour activity organizer called the park but failed to book our ray swim. This sea life park staffer ensured the boys had a swim time and refused to take payment until she confirmed with our hotel whether we had prepaid or not. I chose the package for the dolphin encounter, but ended up wishing I'd paid for the most expensive one. 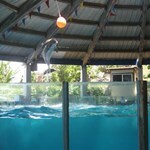 The staff was great and the dolphin were well trained and seemed happy. I wish I could have gotten more hands on time with them, but the time I had was great. I ended up with a very nice photo taken by one of their staff photographers. The only negative I can mention is the tanks throughout the ... morepark seemed to need a good cleaning. I would recommend this as I had a good experience. The rest of the park was enjoyable as well. I love the aviary where you can feed love birds and cockatiels. The gift shops there are very nice to go to but it can be a little on the expensive side. There is a nice snack bar to go to for lunch. 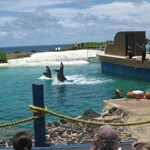 It is a nice marine park to go to and just have a relaxing day in the sun. 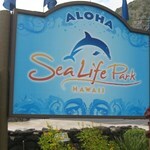 Sea Life Park is great place for the whole family. Many things for everyone to do. But I must recommend that if you go you show try the Royal Swim. Up close and personal meeting and learning about one of the most beautiful and graceful animals of the sea. 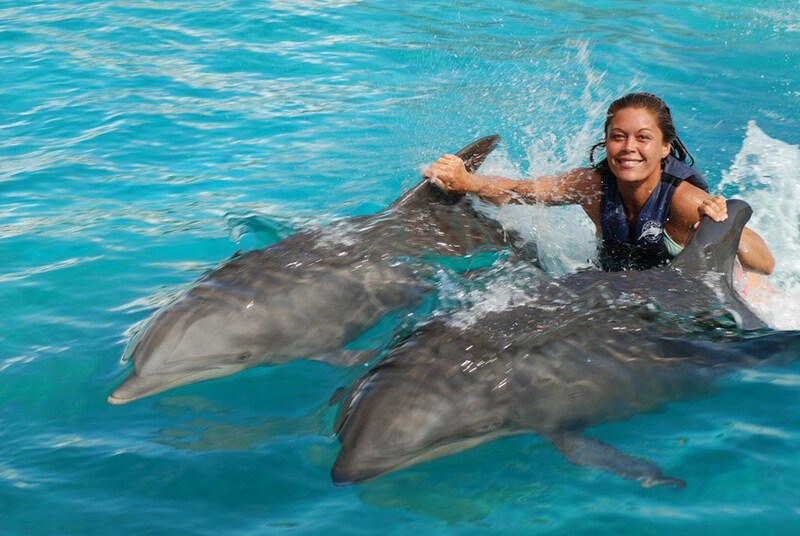 Getting to touch and swim with the dolphins (or in my case whalphins) was absolutely fantastic. 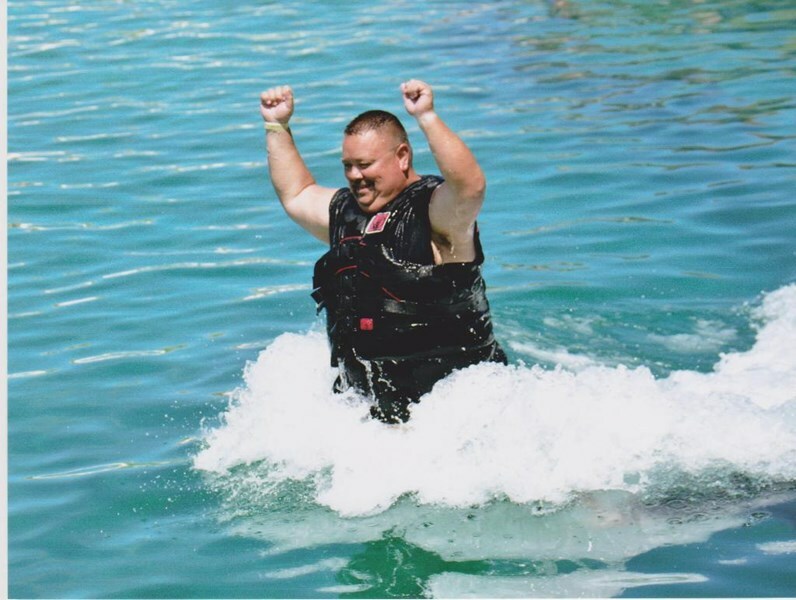 I was a little worried at first because I am a heavy ... moreman, but the strength, grace, and gentleness of the dolphins had me forget all my worries. 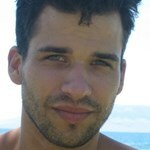 The trainers are very knowledgeable and eager to explain and answer all questions anyone may ask. 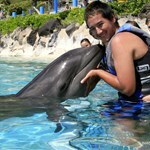 This is a place and attraction I will do again on my next visit to Hawaii. We spent about 10 days on Oahu & my ten year old son said this was the best part of his vacation. Yes, it is expensive to swim, touch, and kiss the dolphins; but, how many times in one's life will you do it or get this chance. 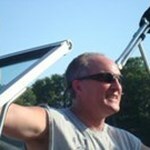 Our family will treasure the beautiful photos forever & enjoy the video on multiple occasions. 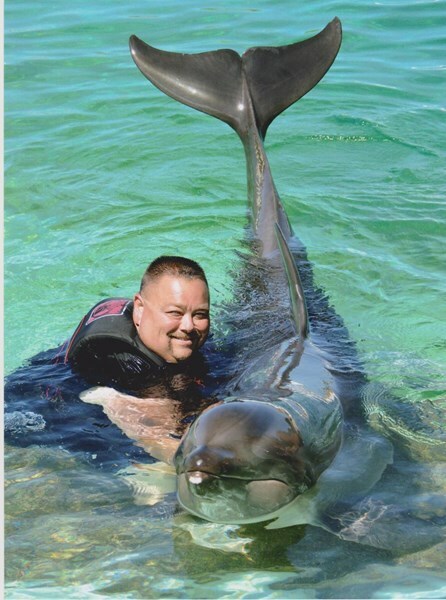 A couple things one will experience: two dolphins will elevate you out of the ... morewater by pushing you up by the soles of your feet & then carrying you approximately 30 feet through the water. 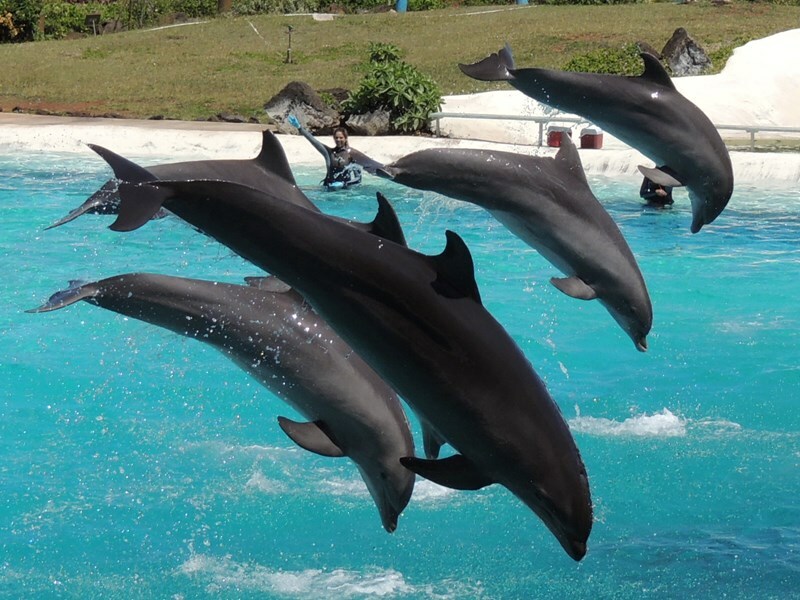 Plus, you will have two dolphins come up under each one of your arms whereby you grab their dorsal fins to be pulled about 40 feet through the water. The Dolphin show was great as well. The large Whalphin (a cross between a killer whale & a dolphin) was a sight to see too. Don't miss this place; plus, the scenery on this side of the island is spectacular.